P. Taylor, "Roy Lichtenstein", Flash Art, October, 1989, p. 89 (illustrated in color). Annandale-On-Hudson, Center for Curatorial Studies, Bard College, Passions and Cultures: Selected Works from the Rivendell Collection, 1967-1991, April 1992-December 1993. Roy Lichtenstein's Reflections; Mystical Painting, combines disparate subjects from the artist's own visual lexicon. 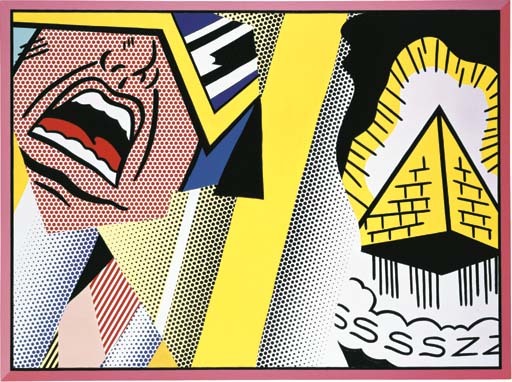 Lichtenstein produced the "Reflections" series in the later part of the 1980s, and each painting refers to visual strategies employed in earlier works. Many of the images appear to mirror back themes in the artist's works through the years, and in fact the mirror, as a source of self-reflection and as a vehicle of gaining perspective, was perhaps the most recurring motif in the artist's oeuvre. When Lichtenstein painted he often used a mirror to reflect an image, following a traditional Renaissance practice, to assist him in discovering any compositional imperfections in his drawing. He took up the subject of the mirror as a method of questioning and as a way to gain objectivity. He reflected on his own art and the art of others, integrating images by Picasso, Matisse, Magritte and Warhol into his paintings, together with images of female models, science fiction cartoons and household appliances. His entire body of work was a reflection, and in many ways this series is a distillation of all of bodies of works he produced from this point, back to the early 1960s. In Reflections: Mystical Painting the screaming man with spy goggles is taken from an X-Men comic, below him in yellow, pink and red are forms that appear like a re-worked fragment from Lichtenstein's "Imperfect Painting" series. On the right half, appropriated from a Batman comic is a golden pyramid that rises with force and apparent sound effect. Rendered in Lichtenstein's signature Benday dots, Reflections: Mystical Painting illustrates the artist's full embrace of Pop imagery, as well as his desire to mirror ideas from the past forward.